Images are used everywhere. If you'll look at your phone or computer memory, around 80% of memory space was occupied by images. On the other hand, we share tons of photos on social media sites especially Facebook, Instagram and Twitter. Millions of photos are shared over WhatsApp daily. Even the post you're reading right now consist of number of images. So basically they are the building blocks of Computer, Internet and Android and without them, these things are nothing. Although images are very small in size but sometimes you may want to reduce or compress them for better optimization. For example, reducing images file size will make it easy to upload them on social media sites or If you have a website/blog, they can improve your webpage loading time. Moreover, they will occupy less memory space and thus good for your system speed as well. There are number of methods by which you can compress your photos. This includes both online and offline tools. In my previous article, I had discussed on how to reduce image size without losing its quality. In that tutorial, I had used an online tool named as JPEG mini. This tool can work on both computer and mobile phone devices. But is there any method to reduce photos size in your Android phone and that too when you're offline. Well this can be possible with the help of WhatsApp. WhatsApp is one the best messaging app which can share text, images, videos and other documents. Obviously, I don't need to introduce you with this app. 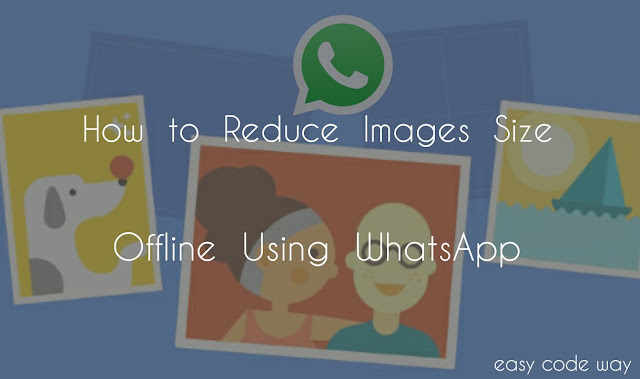 Apart from messaging, WhatsApp can be used as an image compression tool and that too it works offline. Sounds good and bit unrealistic too? But it's true. In today's tutorial, I will discuss on how to make use of WhatsApp to reduce your image file size. Before moving to the steps, first let me tell you about the basic logic behind this tricks. What does WhatsApp actually do? 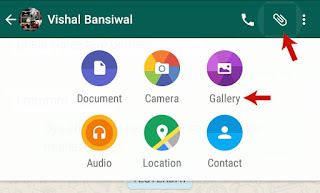 Images are processed in two steps by WhatsApp. 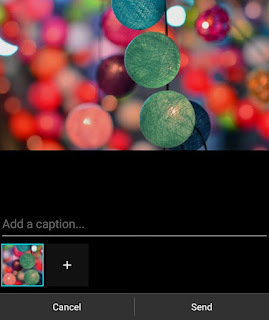 When you'll send a new image to any of the contact or group, it will first compress them. It should be noted that the compression takes place offline and it has nothing to do with your Internet connection i.e., you can compress them even when you're offline. The compressed image will be saved in your phone memory then and at last, WhatsApp will upload & send the new image to the recipient. 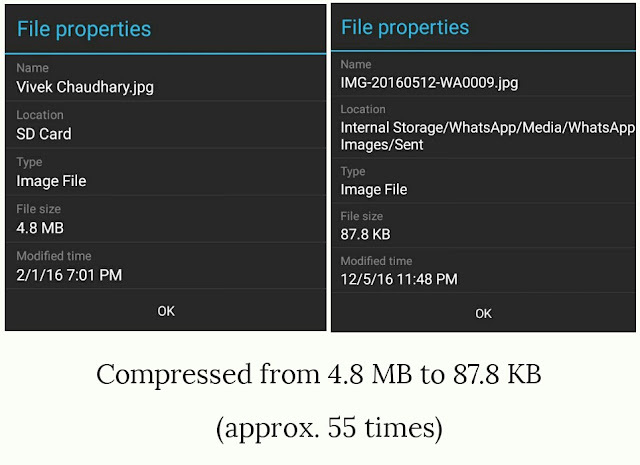 Compressed images are saved in sent folder of WhatsApp and it was hidden for other applications. For example, you can't access it from gallery or other apps. Here we will extract the compressed image from this folder in order to get the reduced file. 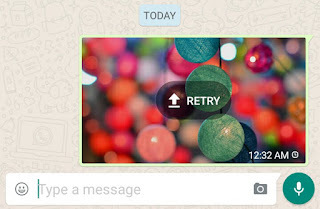 You may be wondering that why WhatsApp process these images in two steps. Obviously, this will reduce the photo size due to which they will be uploaded faster and instantly, thus improve user experience. Now open any contact chat. Here click on attachment icon and then choose Gallery. After this, find and select the image whose file size you want to reduce. You can also add multiple images at once. Now crop or rotate the photo (If you want). Finally click send button and wait for few seconds until "retry" button appears. Note: Before sending the image, make sure that you're not connected to Internet. Otherwise, you may send your private image to the wrong contact by mistake. After processing the image, WhatsApp will automatically reduce its size and save the new compressed file in sent folder. To view it, open your primary file manager (I am using File Commander) and go to "Internal Memory > WhatsApp > Media > WhatsApp Images > Sent" location. Now find your image and use it anywhere. To make it visible for other apps, simply move it to your local photo folder. You can also compress these photos by changing your WhatsApp profile picture but that will crop your image in square shape. So just try this method only. As you can see in above picture, the original file size is 4.8 MB (It's a DSLR photo) and when I compress it with WhatsApp, file size is reduced to 87.8 KB only which is approximately 1/55 times. This is a very big difference. Now lets compare the quality difference between the original and compressed image. Of course, there will be some drop in their quality or pixels but if you'll look at macro level or from normal view, both images will look same. However, if you'll zoom the photo, then definitely anyone can point out the little change in their quality which are normal. For better optimization, use latest version of WhatsApp. You can update your current version from Google Play Store. If you're facing any problem, please let me know in below comment box. Stay tuned for more interesting tutorials.